Steve Chalke, MBE is the founder of Oasis and Stop The Traffik, a UN Special Advisor, author of one of the most controversial Christian books ever released and a Guinness World Record holder. What led to you writing Stop The Traffik with Cherie Blair? I got to know Tony Blair before he became Prime Minister simply because I’m involved in politics. We’d formed a friendship and it grew. Sherie is a human rights lawyer so as Oasis developed Stop the Traffik, I asked Cherie whether she’d be the patron. She was very excited and I said, 'why don’t we write a book together?' She contributed the chapter on Women’s Rights. Are you a Labour supporter? I’m not a member of any political party. The church should never be in the pocket of a political party. We’ve got to be standing up for those who are hungry, those who are in prison with no one to speak up for them. I was asked some years ago about joining the house of Lords as a party peer. I said I wouldn’t, the reason is because you have to take the whip. I have to stand up and say 'I agree with my right honorable colleague because he’s right and even if he’s wrong I still agree with him because he’s in my party'. That’s the compromise that the church can’t take. You’re a UN special advisor on human trafficking. What progress has been made? Moving things forward in a local community is very difficult, moving things forward nationally is very difficult, moving things forward globally is extremely difficult and it’s slow. My job description was I was charged with pushing through media messages. The very fact that you know what human trafficking is says we’ve been successful. There are stories about human trafficking in newspapers every day and that’s because we’ve worked really hard internationally to push this up the agenda. It seems everyone knows about the issue; don’t we need more action rather than more awareness? Yes, people have got to say, 'what do I drink? ', 'what do I eat?' One of Stop the Traffik’s big campaigns is around chocolate. Oasis runs schools and you walk in sometimes sadly to one of our schools and they’ve got a huge campaign going on about Stop the Traffik and they are selling chocolate that’s not fairly traded. I always say to people 'eat chocolate that’s not fairly traded and you will have the blood on your teeth of people who are paying with their lives to produce that stuff'. Were you disappointed that The Lost Message of Jesus has become known for a single controversial phrase; your view that if God punished Jesus it was “cosmic child abuse”? I was disappointed because it’s about Jesus the politician, the social activist. It’s about redeeming the gospel from being a pie in the sky, airy fairy message about what happens to you after you die, to what God is doing here on earth. In another sense, I wasn’t disappointed at all because the furor around it made it the best selling book I’ve ever written [laughs] but much more importantly than that, it propelled Oasis into places it hadn’t been. I was driving through Sussex across the Ashdown forest and my phone went in my car. I answered it and Tony Blair’s organiser said to me 'the Prime Minister has just asked me to ring you because he thinks what you’ve said about God is very important'. I was saying that God is a God of love and the cross isn’t about God getting angry with his son, it’s not God violence that puts Jesus on the cross, it’s people’s violence. Jesus died for our sins means Jesus died because of our sins. Jesus died because the human race is vengeful and angry and Jesus turned the other cheek. The song that says Jesus satisfies God’s wrath [In Christ Alone], well if God has to have his wrath satisfied through getting blood, he’s a lot worse than we are. In the end Tom Wright endorsed it and wrote a whole defense of me. He said there are just two things those who disagree with Steve Chalke haven’t understood; the Old Testament and the New Testament. Oasis began in 1985 but it began about 10 years before that in my head. I was a teenager and I decided when I grew up I wanted to be a church leader, I wanted to start a hostel for kids who had nowhere to live, start a hospital and start a school all for young people that were going nowhere and had no opportunity. I think the church is the big society before the big society was invented. They’re the place of worship but they’ve also been the place of education and health and legal help. The market square grew up around the church, you came to the church for market, for theatre, for education and healthcare. Slowly in the 20th century all of those responsibilities got taken from the church and other people have been doing them. In the 21st century we’re waking up and the governments are waking up and saying it's not working. That creates an enormous opportunity for the church to re-engage. We work with 35,000 people every day of every year. We work in money management and nutrition and creating training. It’s time to move outdoors and the Re-imagine conference on November 10th is about how to reimagine the role of church in society. Einstein says 'you’ll never achieve what you can’t first imagine'. Every church could be running libraries, children’s centres and schools. The whole of society is being re-imaigned at the moment. Having raised £2.32 million for Oasis by running the London marathon, you have the world record for the largest amount of sponsorship money ever raised by an individual through a single event. How did you do it? It took me longer to work on raising the money than it did getting ready for the marathon. They say that for the London marathon, on December 31st you’re incapable of running more than 200 yards but if you follow the training plan in the sixteen weeks between 1st January and 14th April, you can run 26 miles. There’s always one or two people with a lot of money. If you speak to the treasurer at your local church I bet they’ll say 10 people give 80% of the money. The money went to create chaplains in all the schools we run because the pastoral is the area government won’t give to. Government want you to add up and do English literature but that’s short sighted. It’s wonderful that we create numerate literate people but all of that is worthless unless we create people with a sense of morality and self worth. It’s a book by John Howard Yoder called The Politics of Jesus. It was Yoder’s theology that shapes so many of today’s New Testament scholars. Without John Howard Yoder you would have never got Tom Wright. In 100 years time they will say The Politics of Jesus was a foundational document. He was into non violence and he himself was influenced by Ghandi and Martin Luther King. God teaches me constantly that if you’ll take a risk and step out and believe the prayer we’re taught to pray, ‘Your kingdom come your will be done on earth’, if you actually put yourself into that and say I’ll take a risk it’s extraordinary what can be achieved. You’ve got to constantly leap out of the boat and that’s what the church needs to do. This is saying some good things but maybe not about real ordinary human beings. 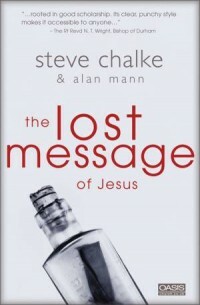 Its easy to espouse political principles if you are in a position like Mr Chalkes but a major part of Jesus message is not about politics, or art or religion or churches, it is just about you, or me and how to cope with life on a simple personal level. if churches forget this intimacy in their efforts to 'serve the community' they can lose sight of the real Jesus i.e. just use his name as 'packaging' and risk becoming empty and meaningless. Sadly another wolf among the flock avoid this man. Steve Chalke has "departed from the faith" and is "giving heed to seducing spirits and doctrines of devils". Mr McAllister .....same old - Preaching the Good News, fighting for the freedom of those held captive and those oppressed. That seems to be what the Gospel is about. I can't imagine anyone reading this, and then giving your unhelpful, ungodly statement any credence. God will be His judge - certainly not you. David McAllister - I'm not sure why you would say this about Steve Chalke. He and his organisations are fully committed to Christ and Chritian principles. He has justice for the poor and oppressed at the top of his agenda, which seems pretty Christ-like to me.